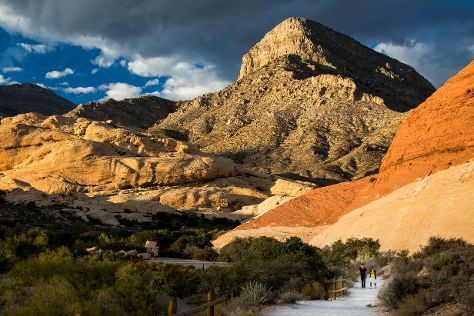 On the 20th (Wed), take in breathtaking views at Red Rock Canyon National Conservation Area. Keep things going the next day: have fun at Battlefield Vegas, get a taste of the local shopping with The Strip, and then ponder the design of Bellagio Fountains. For reviews, maps, where to stay, and tourist information, refer to the Las Vegas trip planner . Denver to Las Vegas is an approximately 4.5-hour flight. You can also do a combination of bus and flight; or drive. The time zone changes from Mountain Standard Time to Pacific Standard Time, which is usually a -1 hour difference. While traveling from Denver, expect somewhat warmer days and much warmer nights in Las Vegas, ranging from highs of 65°F to lows of 45°F. Wrap up your sightseeing on the 21st (Thu) to allow time to travel to San Diego. Kick off your visit on the 22nd (Fri): enjoy the sand and surf at South Carlsbad State Beach and then enjoy the sand and surf at La Jolla Cove. 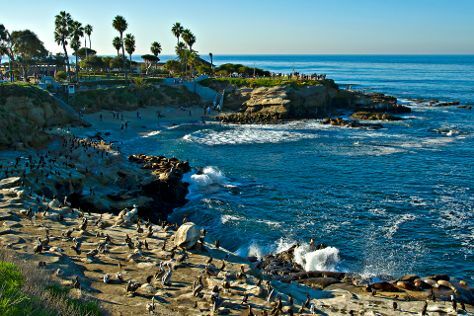 Keep things going the next day: appreciate the history behind Cabrillo National Monument and then admire nature's wide array of creatures at San Diego Zoo. To see ratings, photos, maps, and tourist information, use the San Diego trip maker website . You can fly from Las Vegas to San Diego in 3.5 hours. Other options are to drive; or take a bus. Traveling from Las Vegas in February, expect a bit warmer with lows of 53°F in San Diego. Finish your sightseeing early on the 23rd (Sat) so you can drive to Huntington Beach. Huntington Beach is a seaside city in Orange County in Southern California. 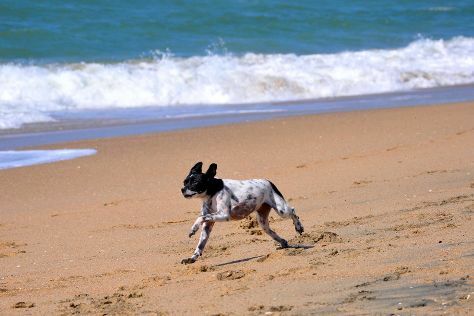 Start off your visit on the 24th (Sun): tour the pleasant surroundings at Crystal Cove, look for all kinds of wild species at Pacific Marine Mammal Center, and then kick back and relax at Huntington Dog Beach. For ratings, more things to do, and other tourist information, use the Huntington Beach trip builder site . You can drive from San Diego to Huntington Beach in 2 hours. Alternatively, you can take a train; or take a bus. In February, daytime highs in Huntington Beach are 70°F, while nighttime lows are 51°F. Finish up your sightseeing early on the 24th (Sun) so you can travel to Tempe. Tempe, also known as Hayden's Ferry during the territorial times of Arizona, is a city in Maricopa County, Arizona, United States, with the Census Bureau reporting a 2010 population of 161,719. Kick off your visit on the 25th (Mon): head outdoors with Right On Target Clay Guides of AZ, identify plant and animal life at McDowell Sonoran Preserve, and then ride a horse along The Gateway Trailhead. To see traveler tips, maps, ratings, and other tourist information, use the Tempe day trip planner . Traveling by flight from Huntington Beach to Tempe takes 4 hours. Alternatively, you can do a combination of bus and flight; or drive. The time zone difference moving from Pacific Standard Time to Mountain Standard Time is 1 hour. In February, daytime highs in Tempe are 74°F, while nighttime lows are 51°F. Finish your sightseeing early on the 25th (Mon) to allow enough time to travel to Moab. Kick off your visit on the 26th (Tue): take a memorable tour with Tours. Get ready for a full day of sightseeing on the 27th (Wed): let the river carry you with a rafting and tubing tour, then explore and take pictures at Delicate Arch, and then take in the dramatic natural features at Turret Arch. To find maps, more things to do, reviews, and tourist information, read our Moab road trip planning website . You can do a combination of flight and car from Tempe to Moab in 4.5 hours. Other options are to fly; or drive. Expect colder temperatures when traveling from Tempe in February; daily highs in Moab reach 50°F and lows reach 25°F. Finish your sightseeing early on the 27th (Wed) to allow enough time to travel back home.